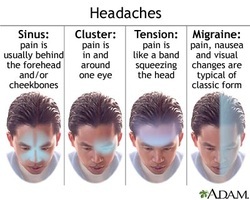 Headache is divided into acute headache and recurrent headache or chronic headache. The causes of acute headache are acute angle closure glaucoma, meningitis, systemic infection, cerebrovascular causes ( intracranial hemorrhage, intracranial infarction or subarachnoid hemorrhage) and trauma. History taken should focus on the site, onset, characteristic, precipitating factors and associated symptoms. In term of site, cluster headache is associated with retro- orbital pain, unilateral headache is associated with migraine, glaucoma is presented with ocular pain and temporal arteritis is associated with claudication of the jaw and localized pain over the superficial temporal arteritis. 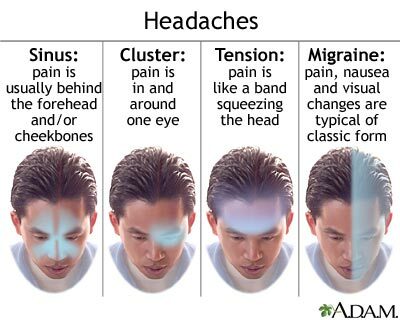 Headache which intensify over minutes which later last for hours is an indication of migraine and cluster headache. In migraine, aura usually precede the headache. Headache due to subarachnoid hemorrhage as a result of rupture of the berry aneurysm usually present as a sudden onset of severe headache pain ( vascular cause). Headache due to meningitis tend to develop over hours to days. Headache which is progressive in nature and develop over hours and days is an indication of raised intracranial pressure due to chronic subdural hemorrhage and tumor. In term of characteristic, tension headache sufferer may complain of a sensation of tight band surround the head, Pain due to raised intracranial pressure typically bursting in quality. Throbbing characteristic is more common in temporal arteritis and migraine related headache. 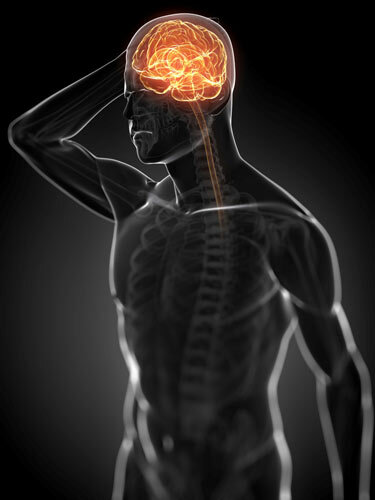 The intensity of the pain is not useful in identifying the cause of headache. Certain food such as chocolate, red wine and cheese may predispose to migraine. Besides that photophobia is common in patient with glaucoma, meningitis and migraine which is relieved by lying in the dark room. Headache may also occur due to withdrawal of substance in patient with substance dependent. Headache due to raised intracranial pressure usually worst in the morning, sneezing, coughing and change in psoture. Glyceryl trinitrate as well as nifedipine may also cause headache. Temporal arteritis is presented with headache while touching the distribution of the superficial temporal atery which is inflamed. Temporal arteritis should be treated with high dose of corticosteroid immediately to prevent irreversible and complete blindness. Glaucoma may present with visual disturbance in the form of haloes. Temporal arteritis is diagnosed with unilateral loss of vision with proximal muscle stiffness, weakness and pain as well as tenderness. Subarachnoid hemorrhage and meningitis may present with neck stiffness /signs of meningism. Abscess, hemorrhage or tumor ( space occupying lesion) may present with progressive onset of headache. Photophobia, flashing lights, nausea, alteration in perception of sizes and vomiting are common in patient with migraine. Glaucoma and cluster headache are present with conjunctival injection and lacrimation. Headache, vomiting, ataxia, drowsiness and dementia in adult are commonly due to normal pressure hydrocephalus. Inspection, palpation and neurological examination are the common form of examination in patient with headache. Examination initially begin with general inspection of the patient Glasgow coma scale is useful to quantifies the consciousness level. Meningitis , raised intracranial pressure and subarachnoid hemorrhage are etiologies which are serious in nature and lead to impairment of consciousness. During an acute attack of cluster headache and acute angle closure glaucoma, conjunctival injection may occur. Semi dilated fixed pupil and hazy cornea commonly occur in case of acute angle closure glaucoma. meningoccoal meningitis may present with petechial hemorrhage. High temperature or pyrexia is an indication of systemic vasculitis or meningitis ( systemic infection). Temporal arteritis is presented with absent of pulsation and tenderness along the course of superficial temporal artery. Neurological examination is performed to identify any structural lesions. Fundoscopy is performed to detect any papilledema. Ischemic optic neuritis may cause temporal arteritis which cause total unilateral loss of vision.Contralateral lesion in the cerebral cortex may present with hemianopia. Stiffness of the neck is a characteristic of subarachnoid hemorrhage and meningitis. However meningitis is presented with pain while the knee is extended when the hip is placed in a fixed position (positive Kernig’s sign). Space occupying lesion such as intracranial hemorrhage an tumor may present with progressive hemiplegia. Migraine is associated with transient hemiplegia. Any concern regarding sinister pathology such as malignancy or cerebrovascular accident may require the urge of investigations. The laboratory investigations may include full blood count, ESR, CRP, urea and electrolyte, alkaline phosphatase, blood culture, CT/MRI scan and lumbar puncture. However, in most cases diagnosis can be made on history and examination only. Full blood count may reveal raised in white cell count due to systemic infection, cerebral abscess and meningitis. Raised CRP and ESR are associated with intracranial bleeding, infection and temporal arteritis. Urea and electrolytes analysis is useful in case of renal disease due to hypertensive headache.. Blood culture is required in systemic infection and meningitis. In Paget’s disease , alkaline phosphatase is elevated. Glaucoma is detected using the tonometry which measure the intra ocular pressure. Temporal artery biopsy is performed . the biopsy may confirm the present of giant cells and inflammation which is common in temporal arteritis. Segmental involvement of the temporal artery may produce a normal biopsy which is misleading. Lumbar puncture is performed after raised intracranial pressure has been excluded ( due to subarachnoid hemorrhage and meningitis). The CSF obtained is inspected and opening pressure is recorded. Breakdown of hemoglobin from red blood cell is presented as xanthochromia or yellow staining. Xanthochromia is associated with subarachnoid hemorrhage. Turbid consistency of CSF is associated with meningitis. Meningitis may also present with raised white cell count. Protein is low but glucose is high in tuberculosis or bacterial meningitis. Viral meningitis is presented with normal glucose and protein level which is midly elevated. CT/ MRI scan is useful for visualization of anatomical structure of the cranium. It is important to detect any neurological defect . During the first 2 weeks, intracranial bleeding is characterized as the area with high density. Cerebral tumor is characterized as low or high density masses. Cresent shaped opacity is due to subdural hematoma while lens shaped opacity is due to extradural hematoma. Intracranial hematoma will become isodense after 2 weeks and difficult to visualize. Blood may be visualized in subarachnoid space as subarachnoid hemorrhage. Arteriovenous malformation and aneurysm may be detected occasionally. Cerebral abscess can be diagnosed with contrast enhanced CT or MRI scan. Hydrocephalus is characterized by enlargement of the ventricles.